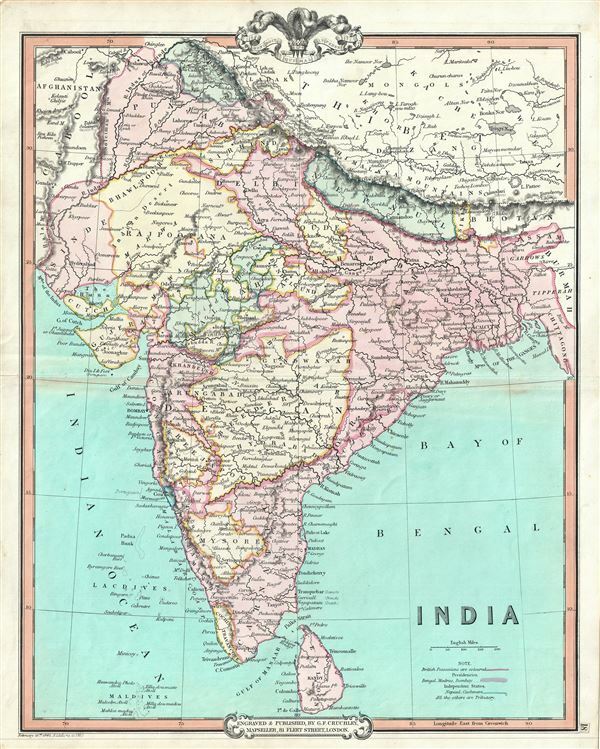 This is an attractive 1850 map of India by George Frederick Cruchley. It covers the Indian subcontinent from Kashmir to the Indian Ocean and includes Ceylon or Sri Lanka as well as parts of Afghanistan and Tibet. The map is color coded according to territories under British Possession, territories under British influence by tribute protection, and independent states. Important towns, cities, rivers, mountains and other topographical features are noted throughout, with relief rendered in hachure. As this map was being drawn, the Indian subcontinent under the hegemony of the British East India Company. The newly appointed Governor General, Lord Dalhousie brought along several progressive changes including education, railways, canals, telegraph etc. At the same time dissatisfaction with the East India Company was rapidly growing. In 1857, the Sepoys of the British East Indian Company would revolt in India's First War of Independence. This would ultimately lead to the dissolution of the east India Company. Subsequently governance of India would be administered directly by the British Crown. The British Raj ruled India until its independence in 1947.